C.A. Rownd built this unusual barn in 1911. C.A Rownd was a descendent of Samuel Rownd, whose nearby house (4119 South Main Street) is also a historic site. 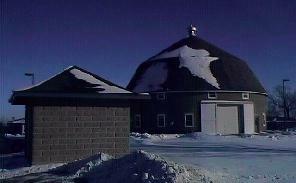 There were many advantages to building a round barn. It was thought that this barn would have much greater resistance to wind pressure, as is presented no broad side to the force of the wind. In addition, the circular design was cheaper, because with the same length of wall there are about 1000 square feet more floor space than in a rectangular barn. The barn is also unusual in that its walls are made entirely of cement. The barn is 66 feet in diameter, with walls that are 18 feet high. It was placed on the National Register of Historical Places in 1986.